For kids, visiting a dentist can sometimes be an uncomfortable experience. Fortunately, many dentists specialize in making children feel more at home in their offices. A combination of gentle hands, humor, and whimisical décor can go a long way in making a trip to the dentist more of an adventure than an ordeal. Here are our favorite kid-friendly dentists in Montana. The team at Rimrock Pediatric Dentistry emphasize making their young patients comfortable—not only at their office but with oral care, in general. A warm, calming staff and a friendly office environment with plenty to keep kids occupied while they wait help to make a visit to the dental office a fun time. Smile Montana Dental Center—the closest dental office to the West Glacier area—claims to “cater to cowards.” That’s not to say that kids are cowards, but that the staff at Smile Montana happen to be extremely gentle and comforting. They also make custom moutguards for athletes, offer orthodontic serveices, and, in case of dental emergencies, have urgent care centers in Columbia Falls and Kalispell. Pediatric Dentistry is home to Helena’s only board-certified kids dentists. 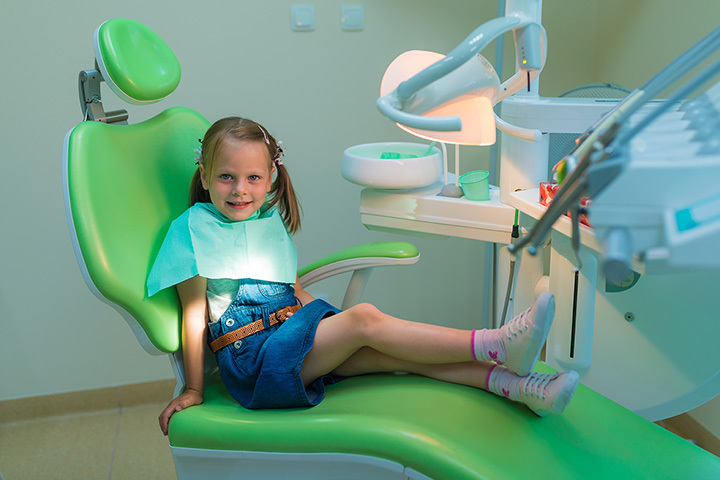 In addition to the staff’s extensive expertise in working with children, Pediatric Dentistry is located in a fancifully-decorated office with plenty of distractions to keep kids from worrying about the dentist. Butte Pediatric Dentistry was the first—and is currently the only—dental practice that focuses on infants, children, and teens in the Butte area. The staff works to make sure that kids have an ongoing, postitive dental experience, so that they and their families will always be comfortable with oral care and dental visits. YMCA Healthy Kids Day with our two toddler mascots (Drs. Ryan & Lindsey's kids) June and Sam! The office of Children’s Dentistry of the Rockies is so fun that even grown-ups enjoy visiting. The dentists and staff are all experts in taking care of kids and their mouths, but they also excel in creating a fun, interactive environment that will make it your child want to go to the dentist more often than they get to. Pediatric Dental Specialists focuses on oral and dental care for patients from infancy through their teen years. The office itself is warm and welcoming, in order to create a friendly and fun environment where kids can learn about the importance of oral care and good dental hygiene. Great Falls Pediatric Dentistry is home the only certified pediatric dentists in the area. Whether infants, children, or young adults, their experienced dentists and staff works to ensure that patients are comfortable and that they learn oral health habits that they can use for a lifetime. My kiddo's dentist office is hoot. The staff and dentists at Big Sky Pediatric Dentistry are friendly, gentle specialists who know how to keep infants, children, and teens comfortable (and entertained) during a dental visit. They strive to create a fun and compassionate atmosphere that will help kids establish good oral health habits. With a focus on preventative care, the pediatric specialists at Gallatin Valley Pediatric Dentistry help to ensure that infants, kids, and teens have—and know how to care for—a smile that will last a lifetime. A fun office and a caring environment will have kids smiling on their way in, as well as on the way out. The dentists and staff at Missoula Pediatric Dentistry believe that good experiences lead to good dental habits. This is why they strive to ensure that kids who visit their practice have an awesome experience. From toys, video games, and fish tank in the lobby to movies during and prizes after the exam, kids would have to try really hard to not have a good time here.